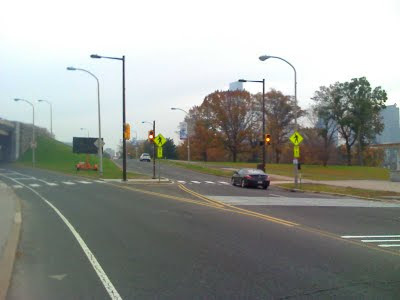 The Philadelphia Streets Department has completed installation of the new traffic signals at the MLK Crosswalk between Schuylkill River Park and the Art Museum which was the scene of a near fatal crash in April. The signals will remain on flash for the next seven days to get drivers familiar with the signals. The signal will be timed on a regular cycle and will not require trail users to push a button. Thanks to BCGP Philadelphia Cycling Committee Chair Russell Meddin for his persistance and to the Streets Department for being pro-active in seeking a solution to improve bicyclist and pedestrian visibility at the crosswalk. We are pleased that our Take Back The Drive Campaign has resulted in this important safety improvement. Schuylkill Banks improvements, people will hopefully feel comfortable using the space. Philly will be bicycle friendly yet!!! "The signal will be timed on a regular cycle and will not require trail users to push a button." This doesn't seem ideal to me. Does it *allow* the trail user to push a button? Is it on a smart timer that varies by day or hour? There is a button at the crosswalk for pedestrians and cyclist to change the signal to cross. The lights were flashing red this morning, but traffic on MLK was flying right through. Doesn't flashing red light == stop sign?